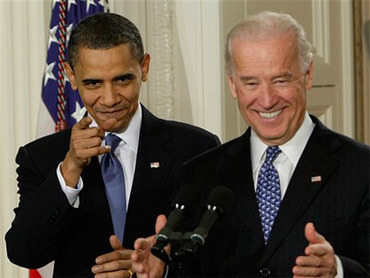 Beyond the ebullient atmosphere, shout-outs and cheers at the White House signing ceremony of the health care bill, there’s another moment that is being rewound and played again and again: Vice President Joseph R. Biden Jr.’s overheard, overly effusive aside to President Obama. At the end of his introduction of the president, Mr. Biden, who is known for ad-libbing to the point of getting him in a little trouble, turned to Mr. Obama, embraced him and elaborated on the historic nature of the day. Accurate as he may have been, Mr. Biden was also on an open microphone. And his remarks sent the media flock abuzz. For whatever reason, Fox News is claiming boasting rights that it was the first to report Mr. Biden’s use of the expletive. As the news fluttered out on Twitter, pardon the puns, through a trail of tweets from White House correspondents and reporters, Robert Gibbs, the White House press secretary, sent out a Twitter post using his own handle – @PressSec. It seemed to affirm Mr. Biden’s sentiment; And yes Mr. Vice President, you’re right.